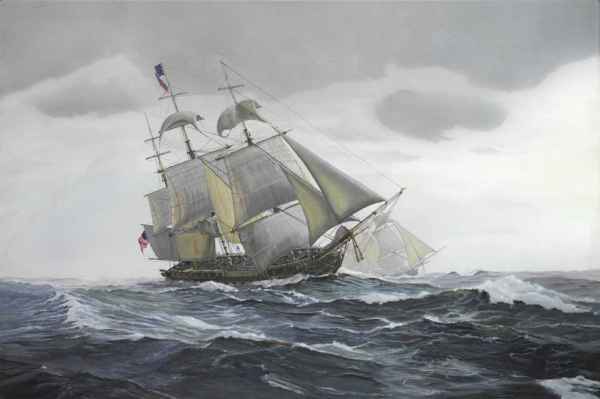 1812 War of 1812: The US warships President (above), United States, Congress, Hornet, and Argus on a cruise in the North Atlantic, engage in an unsuccessful running 8 hour fight with the frigate HMS Belvidera. Philipp Scheidemann (1865-1939), the German socialist politician, [had] ensured his place in history by declaring the creation of a German republic [later referred to as "the Weimar Republic"] from the Reichstag balcony on 9 November 1918. Born on 26 July 1865 in Kassel Scheidemann's early career was in journalism. In 1903 he entered the Reichstag as a member of the Social Democratic Party (SPD). An effective orator with determinedly anti-monarchist views, Scheidemann became one of the First World War's earliest and most enthusiastic supporters in 1914, albeit of a strictly 'defensive' war. Coming out in strong opposition to the annexationist war plans of the Third Supreme Command (led by Paul von Hindenburg and Erich Ludendorff) he was vociferous in expressing his concerns during the Reichstag's war-aims debates in 1916-17. It followed therefore that he should oppose the annexationist terms of the Treaty of Brest-Litovsk, imposed upon Russia in the wake of the latter's decision to leave the war in 1917. With military defeat imminent, Scheidemann was invited to join Max von Baden's final imperial cabinet as a minister without portfolio in October 1918. With the SPD increasingly moving to the left in response to popular feeling Scheidemann, fearing extreme revolutionary measures, summarily and without first seeking approval from either party or government, announced the creation of a new German republic from the Reichstag balcony on 9 November 1918. Thus Kaiser Wilhelm II's fate was sealed. Ebert, appointed Chancellor in von Baden's stead on 9 November, had spent days agonising over the fate of the Kaiser and was inclined to support the creation of a constitutional monarchy. Scheidemann's public announcement of the Kaiser's abdication however forced the matter. From November until February 1919 Scheidemann served on the six-member ruling council of the interim government. He became the Republic's first President in February before resigning four months later heavily tainted by association with the hated Versailles treaty (which he refused to sign). 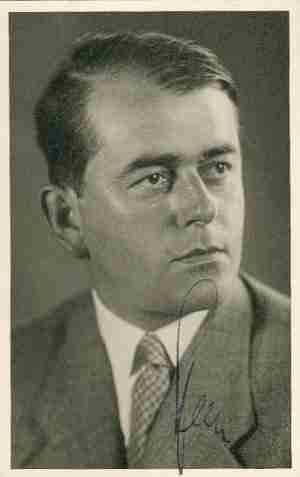 He nevertheless remained a deputy in the Reichstag and as mayor of Kassel from 1920-25 until Hitler's rise to power forced his exile to Denmark in 1933, a figure reviled by rightist forces for his part in the creation of the Weimar Republic. An assassination attempt having failed in 1922, Scheidemann died on 29 November 1939 in Copenhagen at the age of 74. Versailles: Count von Brockdorff-Rantzau led the German delegation which arrived at Versailles on April 29, and was kept waiting for several days. When the first session began on May 7, French newspapers suggested that this was because it was the anniversary of the sinking of the RMS Lusitania. After Georges Clemenceau had accused Germany of being responsible for the war, Brockdorff-Rantzau said that the issue was to reach a lasting peace but admitting that the power of German arms was broken, he nevertheless declared that to admit sole German responsibility for the war would to tell a lie. He stated that the policy of revenge, as well as the policy of expansion, in disregard of the fight of peoples to determine their own affairs contributed to the sickness of Europe, which reached its crisis in the World War. Russian mobilisation took the possibility of curing the disease out of the hands of statesmen and placed the decision into the hand of military force." 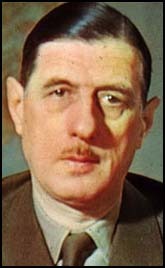 Whilst he admitted wrongs carried out by the former leaders of Germany, he argued that these and other wrongs committed by other nations should be considered by an objective commission with access to all the archives. The German delegation was then granted seven days to respond to the 440 articles. 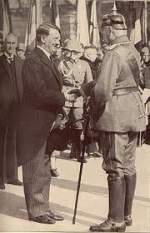 In this capacity, Count von Brockdorff-Rantzau attended the signing of the Treaty of Versailles (1919). He had set out to negotiate a peace based on President Woodrow Wilson's Fourteen Points and a request for the union of Austria with Germany. In practice, he found himself trying to defend Germany against the accusation of sole war guilt; he attacked the atrocities of the Allied blockade on Germany following the armistice on November 11th, and even made the prediction (which was later borne out), that such a treaty would be impossible to fulfill, and cause continual discontent amongst the German people. He was appointed Ambassador to Moscow and played a crucial role in German-Soviet relations until his death from throat cancer in 1928. He [had] developed a close working relationship with Georgy Chicherin, the Soviet People's Commissar of Foreign Affairs from March 1918 to 1930. The Armistice that ended the First World War signed on November 11 1918 ordered for the surrender of all German U-Boats and the handing over of German surface warships to the Allies. In all, over 200 U-boats and 74 warships were interned, awaiting their fate to be decided by peace negotiations. 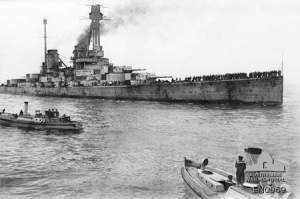 Consisting of over twenty capital warships, including eleven battleships, the Germans had the humiliating task of sailing into Scapa Flow for disarmament. The fleet was manned by a skeleton crew of German sailors under the command of Rear-Admiral Ludwig von Reuter. Crew discipline broke down several times, with many of whom mutinous over the disarmament. The disarmament talks would run for several months, with the representatives of several navies meeting and discussing over the spoils of war. Many nations wanted a share in order to expand their own naval powers while at the same time, it was against Great Britain's interest to see the strengthening of rival navies. Finally, on May 1919, after much extensions and debate, the Treaty of Versailles was ready. It called for the complete surrender of the entire German fleet interned at Scapa Flow. On hearing the news, Admiral Ludwig [was not] too impressed and immediately made plans to scuttle the fleet instead of handing them over. The British were well aware of this possibility and had kept a watchful eye over the activities of senior naval officers. Nevertheless, their window of opportunity would open on the morning of June 21 1919. That morning, the British fleet stationed at Scapa Flow made off to the open seas for training exercises, leaving only a handful of destroyers and armed vessels to guard over the interned German fleet. As soon as the British fleet had left, Admiral Ludwig gave the signal to scuttle. It took about an hour and by the time the British returned, over 400,000 tons of steel was sent to the bottom of the Flow. 1924 US rocket pioneer Robert Hutchings Goddard weds Esther Christine Kisk, a secretary in the President's office of Clark University. The Stahlhelm was founded in 1918 by war veteran Franz Seldte, his brothers and some other soldiers from his unit. The association was originally meant as both a mutual aid society for world war one veterans and as a political combat group like many other that sprung up during the 1920s. In 1926, it numbered half a million members, by far the largest at the time. 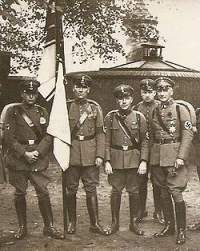 Around this time the Stahlhelm entered politics although, unlike similar groups, it did not endorse a single party, preferring instead to present itself simply as Conservative. It must be said that most of those who became deputies did so as members of the monarchist DNVP or liberal-nationalist DVP. As voelkish elements entered the Stahlhelm, it continued to slide into a more radical and authoritarian mindset that culminated in the more moderate DVP severing ties with them. The Stahlhelm eventually joined the DNVP/NSDAP coalition that brought Hitler to power. Hitler flies to Neudeck to see the dying Hindenburg who, appalled by the continued outrageous behavior of Ernst Roehm and the SA, vows that, unless order is restored, he will declare martial law and turn power over to the army. 1940 World War II: Armistice negotiations begin: not at Compiègne, as is generally mis-stated, but during the night of the 21st at Tours. The French party would be brought, to their horror, to Compiègne, on the morrow, to sign. General Erwin Rommel turns his assault on the British-Allied garrison at Tobruk, Libya, into victory, as his panzer division occupies the North African port. Britain had established control of Tobruk after routing the Italians in 1940. But the Germans attempted to win it back by reinforcing Italian troops with the Afrika Korps of Erwin Rommel, who continually charged the British Eighth Army in battles around Tobruk, finally forcing the Brits to retreat into Egypt. 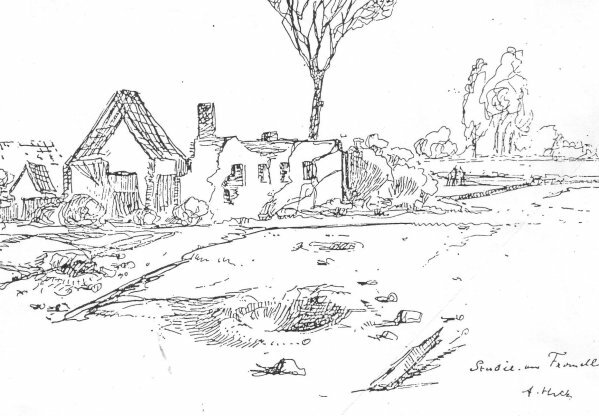 All that was left to take back the port was the garrison now manned by the South African Division, which also included the Eleventh Indian Brigade. With the use of artillery, dive-bombers, and his panzer forces, Rommel pushed past the Allies. Unable to resist any longer, South African General Henrik Klopper ordered his officers to surrender early on the morning of the 21st. Rommel took more than 30,000 prisoners, 2,000 vehicles, 2,000 tons of fuel, and 5,000 tons of rations. Adolf Hitler awarded Rommel the field marshal's baton as reward for his victory. "I am going on to Suez," was Rommel's promise. On June 21, 1942, the Imperial Japanese Navy submarine I-25 shells the U.S. Army's Fort Stevens coastal defenses on the Oregon side of the mouth of the Columbia River. The Japanese are retaliating for the U.S. bombing of Japan the prior April. The U.S. batteries do not return fire and there is no serious damage. The attack is the first enemy shelling of a U.S. mainland military installation since the War of 1812. The mouth of the Columbia River was defended by three Army forts: Fort Stevens on the Oregon side and Forts Canby and Columbia on the Washington side. 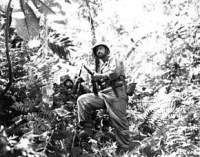 In 1942, Coast Artillery and National Guard units manned heavy guns and mortars dating from the turn of the twentieth century. The weapons covering the beaches dated from World War I. On April 18, 1942, 16 U.S. Army B-25 bombers attacked the Japanese home islands after being launched from the aircraft carrier USS Hornet. The Doolittle Raid, as it came to be known, had little tactical effect and all the planes were lost. The episode did cause Japanese military leaders to adjust their disposition of forces throughout the Pacific. A number of I-class, long-range submarines were dispatched across the Pacific to raid shipping and the U.S. and Canadian West Coast. The Japanese high command dispatched submarines I-25 and I-26 to the Pacific Northwest to look for naval vessels headed to Alaska and the Aleutians. On June 20, 1942, I-26 shelled the lighthouse at Estevan Point on Vancouver Island, and I-25, under the command of Commander Meiji Tagami, torpedoed and shelled the freighter SS. Fort Camosun off Cape Flattery. The freighter did not sink and she was towed to safety in Neah Bay. On the evening of June 21, 1942, the I-25 used a screen of fishing boats to avoid minefields off the Columbia and took position off Fort Stevens. On the surface, the crew fired its 14 cm (5.5 inch) deck gun at the shore without taking aim. At the first shot, soldiers at the fort manned their guns and searchlights, and lookouts could see the sub firing. But the enemy ship was plotted (erroneously) to be out of the range, and the artillerymen never received permission to return fire. Also, the fort's commander did not want to give away the precise location of the defenses. The I-25's shells fell harmlessly in the sand and scrub around Battery Russell, damaging only the baseball diamond backstop and a power line. One soldier cut his head rushing to his battle station. At about midnight, firing ceased and the sub departed to the west, then north. The Japanese crew fired 17 rounds, but witnesses ashore only counted between 9 and 14 shots. Some shells might have been duds or might have fallen into the sea. I-25 attacked the U.S. again in September 1942 when it launched an aircraft that dropped incendiary bombs in the forests in southern Oregon. There was no conflagration as was hoped by the high command. I-25 then attacked and sank two ships off the Oregon coast, and torpedoed a Soviet submarine by mistake in the mid-Pacific. U.S. destroyers sunk the I-25 in 1943. Several of her crew had been transferred and they survived the war to relate their stories. The attack on Fort Stevens illustrated a flaw in U.S. coastal defense strategy. Despite the efforts of military engineers, enemies could always develop weapons with longer ranges than coastal guns. The I-25's small deck gun could outshoot the big rifles and mortars in the fort. By January 1944, most Coast Artillery units had been disbanded. In 1975, the property became a unit of the Oregon State Parks system. War in the Air: The RAF launches a heavy raid on Krefeld in the Ruhr (44 aircraft lost). 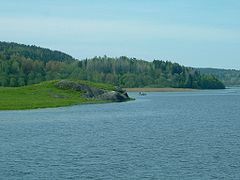 The Red Army begins an offensive between lakes Ladoga and Onega on the northern front. War in the Air: The US 8th Air Force carries out raids on Berlin, and on the synthetic fuel plants at Leuna-Merseburg. "Alas! The Stars of the Generals have fallen with the setting of the waning moon over Mabuni . . . .
"The pale moon shimmers bluish white over the waters of the southern sea, but on Hill 89 which juts abruptly from the reefs, the rocks and boulders are dyed crimson by the blood of the penetration unit which, with burning patriotism, rush the American positions for the last stand. The surrounding area displays a picture of concentrated fireworks; bursts of naval gun fire, flashes of mortar and artillery fire, to which is added the occasional chatter of machine guns. . . .
"Gathered around their section chiefs, members of each section bow in veneration toward the eastern sky and the cheer of "long live the Emperor" echoes among the boulders . . . . The faces of all are flushed with deep emotion and tears fall upon ragged uniforms, soiled with the dirt and grime of battle . . . .
"Four o'clock, the final hour of Hara-kiri; the Commanding General, dressed in full field uniform, and the Chief of Staff in a white kimono appeared . . . . The Chief of Staff says as he leaves the cave first, "Well, Commanding General Ushijima, as the way may be dark, I, Cho, will lead the way." The Commanding General replies, "Please do so, and I'll take along my fan since it is getting warm." Saying this he picked up his Okinawa-made Kuba fan and walked out quietly fanning himself . . . .
"The moon, which had been shining until now, sinks below the waves of the western sea. Dawn has not yet arrived and, at 0410, the generals appeared at the mouth of the cave. The American forces were only three meters away [sic.]. Four meters away from the mouth of the cave a sheet of white cloth is placed on a quilt; this is the ritual place for the two Generals to commit Hara-kiri. The Commanding General and the Chief of Staff sit down on the quilt, bow in reverence towards the eastern sky, and Adjutant J. respectfully presents the sword. Finally, the time for the honored rites of Hara-kiri arrives. 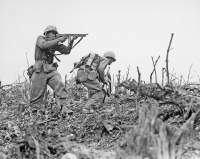 At this time several grenades were hurled near this solemn scene by the enemy troops who observed movements taking place beneath them. A simultaneous shout and a flash of a sword, then another repeated shout and a flash, and both Generals had nobly accomplished their last duty to their Emperor. "All is quiet after the cessation of gunfire and smoke; and the full moon is once again gleaming over the waves of the southern sea. Hill 89 of Mabuni will live in memory forever." The death of General Ushijima and his Chief of Staff, General Cho, marked the end of the Okinawa campaign and the 32d Army. Jackson: Now there has been some testimony about your relation to concentration camps, and, as I understand it, you have said to us that you did use and encourage the use of forced labor from the concentration camps. Speer: Yes, we did use it in the German armament industry. Jackson: And I think you also recommended that persons in labor camps who were slackers be sent to the concentration camps, did you not? Speer: That was the question of the so-called "Bummelanten," and by that name we meant workers who did not get to their work on time or who pretended to be ill. Severe measures were taken against such workers during the war, and I approved of these measures. 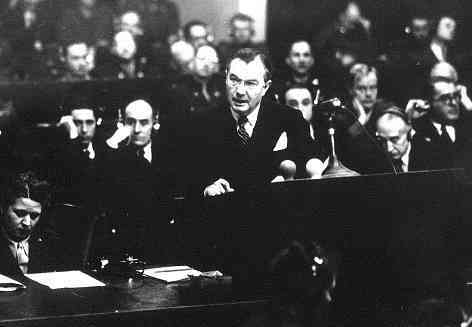 Jackson: In fact, in the 30 October 1942 meeting of the Central Planning Board you brought the subject up in the following terms, did you not—quoting Speer—"We must also discuss the slackers. Ley has ascertained that the sick list decreases to one-fourth or one-fifth in factories where doctors are on the staff who examine the sick men. There is nothing to be said against SS and Police taking drastic steps and putting those known to be slackers into concentration camp factories. There is no alternative. Let it happen several times, and the news will soon get around." That was your recommendation? Jackson: In other words, the workmen stood in considerable terror of concentration camps, and you wanted to take advantage of that to keep them at their work, did you not? Jackson caught him off guard in a moment which perhaps revealed more about Speer than any other remark he made at Nuremberg. Jackson produced records of eighty steel whips used at Krupp's for disciplining workers. 'These are nothing but replacements for rubber truncheons,' expostulated Speer. 'We had no rubber and for that reason the guards probably had something like this,' adding quickly that like the nightsticks of American policemen, the whips or truncheons were not necessarily used. But his initial response is the significant one; was the use of the steel whip the kind of improvisation Speer had specialized in to overcome the lack of raw materials, the way he won the goodwill of his workers, produced an industrial miracle with an increased labor force of only 30 per cent? Fritzsche recorded the prophecy of other defendants that Speer would be found guilty but given the benefit of extenuating circumstances. Can a court weigh in the balance millions of German lives saved against those millions of slave laborers lost or damaged, and arithmetically reach a just sentence? Arthur Miller defies the House Committee on Un-American Activities and refuses to name suspected communists. Johannes Stark was born in Schickenhof, Germany, on 15 April, 1874. He was educated at the local grammar school in Bayreuth before attending the University of Munich to study physics, mathematics, and chemistry. After graduating in 1897, Stark worked at the Physics Institute in Munich until becoming a lecturer of physics at the University of Gottingen (1900-1906), and professor of physics at the Technische Hochschule in Hannover (1906-1909). Stark correspon[ded] with Albert Einstein, and this resulted in him exploring what became known as the light quanta hypothesis. In 1913 Stark modified the photo-equivalence law that had been proposed by Einstein seven years earlier. In 1919 Stark discovered the splitting of spectral lines in a electric field and six years later won the Nobel Prize for Physics as a result of his work on electro-magnetism. In 1922 Stark published The Present Crisis in German Physics (1922). 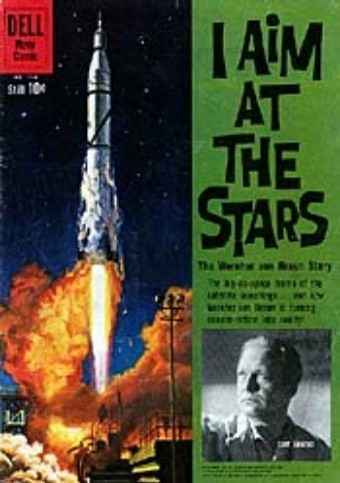 The book contained a scathing attack on Einstein's theory of relativity. He also criticized Nils Bohr and his quantum theory. 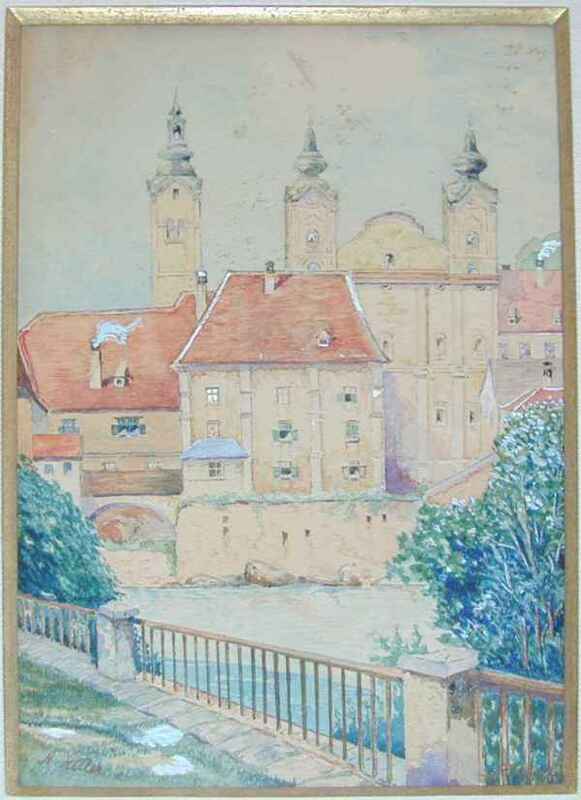 Stark's controversial views isolated him from the scientific community in Germany and in 1922 he resigned as professor of physics at the University of Wurzberg and started a porcelain factory. The business venture was unsuccessful and Stark began to develop nationalistic right-wing political views. In 1924 Stark, began making speeches supporting Adolf Hitler. Stark shared Hitler's racist views and attacked the work of Jewish scientists in Germany, claiming that they were unconcerned with "scientific objectivity". Stark joined the Nazi Party in 1930 and over the next few years he joined with another German physicist, Phillipp Lenard, to integrate physics with fascism. After Hitler came to power in 1933 Stark was appointed president of the Reich Physical-Technical Institute and head of the German Research Association. In his book, Nationalsocialismus und Wissenschaft (1934) Stark argued that the scientist's first duty was to the nation. He denounced theoretical physics and stressed the need for research to be carried out that would help industry and arms production. Stark also argued that leading scientific positions in Nazi Germany should only be held by ethnic Germans. 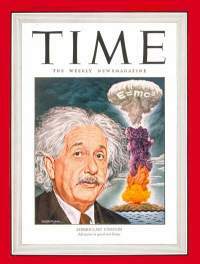 Stark was particularly critical of Jewish scientists such as Albert Einstein. When Werner Heisenberg defended Einstein and his theory of relativity Stark wrote an article in the Nazi journal Das Schwartze Korps, where he described Heisenberg as a "White Jew". After the Second World War Stark was arrested and sentenced to four years' imprisonment by a denazification court in 1947. Johannes Stark died on 21 June, 1957. 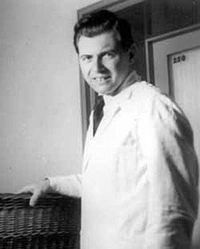 American, Brazilian and West German forensic pathologists confirm skeletal remains exhumed in Brazil are those of Nazi Dr Josef Mengele. Please Note: The list-owner and moderators of 3rdReichStudies are not responsible for, and do not necessarily approve of, the random ads placed on our pages by our web server. They are unfortunately, the price one pays for a 'free' website.